Landscape rotation was added to the Plus-sized iPhones with the original- the iPhone 6 Plus in iOS 8. The reason why I remember landscape being available on the iPhone 6 Plus is because I used it right from the start. I was on board with the Plus size as soon as the 6 was available. I followed the 6 Plus up with the 6S Plus and 7 Plus the next two years, as well. I remember using the landscape Home Screen during those three years and appreciating that Apple added it. What I forgot was that landscape orientation for the Home Screen went away with the iPhone X. It was such a new and different device with so many improvements that I didn’t really notice its absence, and didn’t complain when I did. Even though the X really has a Plus-sized screen, I understood the logic. That feature went with the Plus phones, and the X wasn’t classified with them. Maybe that’s taking semantics a bit too far, but this is Apple we are talking about here. I didn’t think it was a big deal, as most of us who follow Apple expected a Plus-sized version of the X this year, and we were right. This time the logic doesn’t really line up as well. Apple has released a new “Max” class of device to go with the iPhone XS. Ok. They even added the app enhancements that went with the Plus-sized phones, such as the ability to access folder selection menus and side bars in stock apps such as Mail and Notes. Cool. I’m just not sure why they would bypass the landscape function on the XS Max. Why add one feature of the Plus class back and not the other? At the end of the day, this is a small detail, and it really wouldn’t surprise me if landscape for the Home Screen randomly shows up in a 12.x update. This may have just not made the ship deadline, or less likely, may have been overlooked. Who knows. Maybe it will come when the new iPad Pros are released in October. Maybe if we are really lucky, we will get Face ID capability in landscape on the iPhone at the same time. This would actually be useful for some tasks and use cases, and it even plays into the reason I thought about landscape for the Home Screen going AWOL on the XS Max. I’ve had videos playing in the background as I worked today, so my XS Max has been propped up with a stand in landscape mode most of the day. Any time I had to pause the video and the screen would go off, I had to pick the phone up and rotate it to unlock it again because Face ID is still locked to portrait orientation. Any time I went back to the Home Screen, I noticed that the icons didn’t rotate, and that’s what initially got me thinking about this. While the lack of landscape isn’t a big deal in the grand scheme of things, it is handy in a situation like I had today. When your device is parked in landscape, it helps when it actually works in landscape. When your device has a large screen that’s a crisp and clear as this one, you are more likely to use it in landscape for extended periods to watch video content. So I can’t help but think it makes sense for this feature to come back around soon. Even more critical to a good experience than landscape support, however, is Face ID recognizing in landscape. That would allow me to just keep my iPhone docked in its stand, no matter what I’m doing. Like I said before, maybe Apple will surprise us and we will get both of these features in a couple of weeks when they take the wraps off the new iPad Pros. These two features together would be an easy way to make a great device just a little bit better. What do you think? 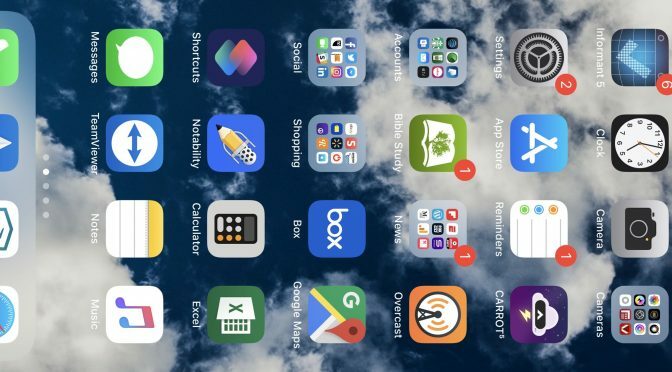 Have you missed not having landscape on the Home Screen? Couldn’t care less? How about Face ID in landscape? Would that help you on your iPhone XS Max? Let me know what you think in the Comments section below, on Flipboard, our Facebook page, on Twitter, or on our new Instagram account.